Section 3.2 Linear Programing Problems. if you don't do it correctly. Set up the following linear programing problems. Do not solve. and each pig $20 in pro t. How many of each animal should be raised? disks should Hi-Fi order so that its total ordering costs will be kept to a minimum? keep its shipping costs to a minimum? • Note: if you multiply or divide an inequality by a negative number, then you must flip the sign. ities true. Sometimes this is called the solution set. • When graphing inequalities use a solid line for ≥ or ≤ and use a dashed line for < or >. a little bit easier to work. 1. Graph the line represented by the inequality: solid line for ≥ or ≤ and dashed line for < or >. is not on the line. 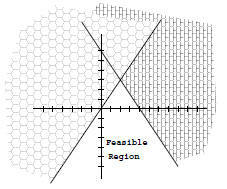 Example 1: Here are feasible regions for the inequalities 3x − 2y ≥ 0 and 3x + 2y ≤ 12.
graph that doesn't get scratched o . Example 2: Here is the feasible region for the system of inequalities: 3x − 2y ≥ 0 and 3x + 2y ≤ 12.
its di erent styles of graphing. If your inequality was y ≥ then select to scratch o what is greater. graphing style, then you can graph the feasible region. • A feasible region is bounded (fenced in) if it can be enclosed by a circle. Otherwise it is unbounded. Section 3.3 Method of Corners. - If the objective function has a maximum or a minimum then it will happen at a corner point. - If R is bounded, then f will have both a maximum and a minimum. - If R is unbounded, then f may or may not have a maximum or a minimum. - If R is unbounded, a > 0, b > 0, and x; y ≥ 0, then f will have a minimum. which point or points will give the desired result. points on the line segment connecting A and B are also a maximum(minimum). has a maximum or a minimum.